A car requires continuous maintenance and there are a whole host of things that can go wrong and will need repairs sooner or later. So it helps to know what’s what, and what’s wrong when you are confronted with a malfunctioning vehicle. Below, we have listed some of the most common transaxle and transmission problems that people face, and have also outlined what causes them, the symptoms you can recognize them by, and the average cost of repair. When you know exactly what’s wrong with your vehicle, you can assess whether it’s a problem that needs to be fixed by the repair-shop, or if you can find an easier and cheaper fix if you do it yourself. You are also less like to get ripped off or overcharged by repair-shops when you know what the problem is and how much the repairs should cost. This normally happens if your transmission fluid leaks for some reason, and can be recognized by a slipping, overheating or failed transmission, a delay in engaging the gear, and hard or irregular shifts or none at all. The easiest repair is to refill transmission fluid, if no other damage has been done. A repair-shop will do it for $20-$30, while DIY will cost you $5-$10 per Quart ATF. If the lack of transmission fluid has caused permanent problems to other mechanisms within the vehicle, this will involve further repair costs for the affected systems. It is also important to note that transmission fluid is not consumed or burned by the vehicle, so low transmission fluid indicates a leak which will need to be fixed. This will happen because of lack of servicing, blocked filters, or overheating, and can be identified by a slipping transmission, overheating, delays in engaging the gear, malfunctioning or no shifts, or if transmission fails. The best repair is to have fluid and fluid filter changes or do a fluid flush. Having the fluid and filter replaced at a repair-shop will cost you around $120-$225, and doing it yourself will cost you $45-$55. For a fluid flush, a repair-shop is likely to charge you $140-$320, while you can DIY for around $65-$90. It should be noted that burnt fluid may sometimes cause internal damage if not identified at the right time. This can be determined by checking if there is clutch or metal debris in the fluid pan, and damaged parts will have to replaced. There may be various causes for this, most of them often external damages, which can be repaired easily for a reasonable cost. A fluid leak, as mentioned above, can be identified by a low fluid level. The easiest fix is to get the leak fixed and refill the fluid. A repair-shop will charge you $50-$500 for this, if the leak is external, and DIY will cost you $25-$100. If the cause of the leak is internal, however, it will have to be repaired at the shop as the transmission needs to be taken out of the vehicle. This repair may cost you over $500. This will be caused due to the fluid running low, a failure in the Solenoids, worn out clutches, or if the fluid is burnt, dirty or old. It can be identified by the engine’s high RPM but a slower speed regardless, an overheating transmission, or if slipping is experienced in between shifts. The first thing that need to be done if this is experienced is to diagnose the problem and identify its source, which could be any of the problems outlined above. Having this done at the repair-shop will cost you $75-$125, while diagnosing the problem yourself will cost you nothing but a little bit of time. For a detailed diagnostic report, a transmission scan can be undertaken at the repair-shop. If the transmission fluid is old, dirty, burnt or running low, or if an electrical circuit is open, or the solenoids fail, this can lead to a number of shift problems, like abnormal shifts or the vehicle shifting into the wrong gear. Like before, the key is diagnosis, which can be performed at the repair shop for $75-$125 (price range includes cost for a transmission scan) or at home for no cost at all. This could be caused if there’s an open electrical circuit, if the PCM or TCM fail, or if the speed or other sensors stop working, and can be recognized rather obviously if the automatic gear shifting mechanism has stopped working but the gear can still be shifted manually. Initial diagnosis can be carried out at home for no cost but if that does not reveal anything, the car will have to be taken to the repair-shop so that a diagnosis of electrical problems or computer and sensor issues can be undertaken. This will cost around $75-$125. If you notice that the transmission is downshifting randomly and then going back to normal as well, this could be cause by an electrical malfunction, or if the speed, transmission range, or throttle position sensors stop working. Initial assessment can be carried out at home and the vehicle can be taken to the repair-shop for a full scan of electrical and computer systems, and all sensors. A custom diagnosis will cost between $75-$125. If you notice that the transmission is slipping out of gear every time the vehicle gets warmed up, this is probably due to fluid passing through a leakage in the internal seals not allowing pressure build up. 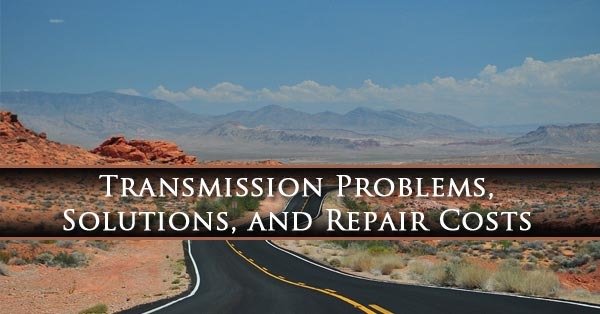 In such a situation, the best course of action is rebuilding or replacing the transmission. The repair-shop will normally charge you $1,600 to over $3,500 for rebuilding, and $1,900 to over $3,800 for rebuilding the transmission. You can do this at home, in which case rebuilding the transmission will cost you between $400-$700 and replacing it will cost you $1,200 to over $3,000. The prices mentioned above are true if you purchase a remanufactured transmission. Cost of a used transmission will be must less. SYMPTOM(S): If you notice smoke or a burning smell, most likely caused by burning coolant, oil or transmission fluid, or if the transmission fails, the vehicle has most likely overheated. This can be caused if the transmission fluid is running low, or if it is dirty or burnt, if the filter is blocked, or if the vehicle has been driving under immense load. Other causes may include cooling lines or oil cooler malfunction, overheated engine, slipping, and failure of the transmission fluid pump. It is important that overheating is identified and diagnoses immediately, as it can cause permanent damage to the vehicle. If you are able to diagnose the source of the overheating at home, you’ll save on diagnosis fees, which will normally be around $75-$125 at the repair shop. Internal problem stopping a pressure build up or a problem in the valve may cause the transmission’s forward gears to stop working, while the reverse gear may still be functioning. The first step is a proper diagnosis of the problem, for which the repair-shop will charge you $75-$125. When the diagnosis has revealed the source of the problem, you can have the valve replaced at the repair shop for $375 to above $1,000, or you can purchase and install it yourself, which will cost you $250 to above $1,000. If it’s the transmission that needs rebuilding, the repair-shop will charge you $1,600 to above $3,500 for the task, or you can rebuild it yourself for $400-$700. It must be noted that if it’s a problem in the valve body, it will normally show up only under a transmission scan which the repair facility will have carry out. Opposite to a similar problem mentioned earlier, if the reverse gear transmission has stopped working while the forward gears may still be working, this could be caused by a leakage in the valve body that is not allowing the required pressure to build up. Having the problem diagnosed at the repair-shop will be around $75-$150, and valve repair costs will be the same as those mentioned above. If you have been using your vehicle for towing heavy objects or driving it under other harsh conditions, or if the torque converter is worn out or hasn’t been installed properly, this may cause the torque converter to malfunction. You can identify this if you experience shuddering in the vehicle, if the shifts are malfunctioning, if there is delay in engaging the gear leading up to no engagement at all, if you hear a strange whining sound when firing up the vehicle, or if the engine revs up more than the vehicle accelerates at start-up but gets better later. Diagnosis at a repair shop, as mentioned above, will cost around $75-$125, and you will be charged $600 to above $1000 for having the torque converter replaced. If you purchase and replace it yourself, it will cost you around $145-$250. It is important to note that the torque converter may, on some occasion, disintegrate upon failure. This can be identified by clacking or grinding noises from the transmission area. When this is heard, turn off the engine immediately or serious damage may be caused to the transmission. Furthermore, even if the torque converter has started failing, your vehicle will still continue to work for quite some time before the converter fails completely. But driving the vehicle in this condition is dangerous as it may cause it to internally disintegrate when it fails, resulting in the debris getting mixed with the transmission fluid and causing serious damage to the transmission. If your shifter level locks itself in the park position on occasion, this may be due to a fault in the brake-pedal position or shift interlock switches, or if a fuse has blown. This will have to diagnosed and repaired, for which the repair-shop may charge you $35-$65 and $50-$250 respectively. Diagnostic charges may be waived if the repair-shop carries out the repairs as well. The repair cost will be determined by the system that needs to be repaired. If it’s a simple brake-light switch replacement, it won’t cost you as much as having the shift interlock switch replaced. If this happens, it is probably caused by a worn out or damaged parking pawl, or a bad rear U-joint. Diagnostic at the repair-shop will cost around $50-$65, with parking pawl and U-joint replacement charges coming up to about $500-$1,000 and $75-$115 respectively. Diagnostic charges may be waived if the repair-shop carries out the repairs as well. If you decide to replace the parking pawl yourself, it will cost you $45-$90, and replacing the U-joint yourself will be $10-$25 on average. This will be signified by the vehicle rolling forward even with the shifter in neutral position, and can happen if the shifter linkage is loose, if the shift indicator is directed towards a wrong gear, or if the shifter cable has been damaged. The solution is pretty simple. You can diagnose the cause of the problem yourself or have it taken to the repair-shop for diagnoses, which will cost you $40-$50 in diagnostic fees. If the cause turns out to be a loose shifter linkage, you can tighten it yourself at no cost, or have the repair-shop do it for $50-75. If the condition is being caused by a damaged shifter cable, the repair-shop will charge you $125-$250 for replacement, or you can purchase and replace it yourself for around $35-$80. Knowing what ails your vehicle and being able to identify a problem and diagnose its cause will give you confidence when dealing with a repair-shop and save you considerable amount of money on repairs. 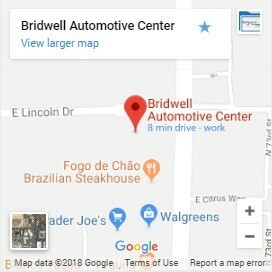 If you need help with Transmission Repair in Scottsdale, look no further than Bridwell Automotive Center located at 7171 E Lincoln Dr or give us a call today at (480) 948-4781. I had no idea that if your transmission fluid was running low, it could cause permanent damage to other parts of the engine. My father’s car takes some time shifting gears. Does this mean he needs to change his fluid or does the transmission need to be replaced? My 4×4 truck is stuck in neutral wont go into any other gear it is a manual trans do you no why?